I’m in ur Eden, defying ur Gawd. 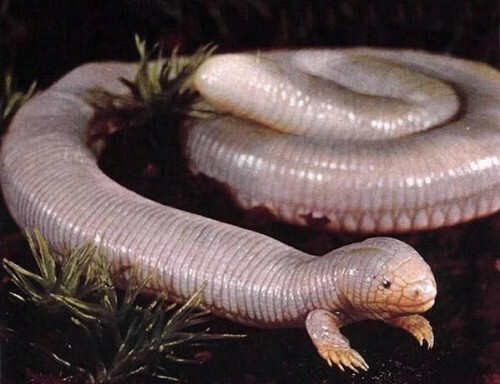 It looks more like an earthworm with scales, legs and a snake’s head. Ajolote: Mexican reptile of the genus Bipes. It and several other tropical burrowing species are placed in the Amphisbaenia, a group separate from lizards and snakes among the Squamata. Unlike the others, however, which have no legs, it has a pair of short but well-developed front legs. In line with its burrowing habits, the skull is very solid, the eyes small, and external ears absent. It’s so cute and cuddly! I want to hold it and pet it and name it FRED…. Except a Mexican Walking Snake?